When I first came to Saint Etienne to stay, because of meeting a French man reasons I cried. Of all the places in France – the picturesque villages, the chic cities, the old buildings – at first glance Saint Etienne has none of this. I lived in a small apartment above a main road next to a train line. It is a small post-industrial city about one hour south west of Lyon in the centre of France.  In the past it was famous for the manufacture of guns, bicycles and ribbons and coal mining. All these industries have declined to nothing, hence the tag ‘post industrial’. In 2010 it became ‘Saint Etienne UNESCO Ville du design’ and is host to a design biennale in March every second year. Other UNESCO ‘Creative City/Design’ cities are Beijing, Bilbao, Buenos Aires, Turin and Berlin, all of which have a notable design culture. I went to the Biennale in 2013. One of the showcase exhibits described designs for the future and there was all sorts of crazy stuff – flying pod cars, multi-purpose household utensils and furniture and ideas about food in the future. There was information about steaks that are being cloned in laboratories, pills that provide all the nutrition that you need and somehow this algae that can in principle be feed straight into your brain, saving on resources that are used for food production. Now I like it. There are many little pockets of beauty (6), (8) and I’ve found my people – the boulanger, the boucher, the fruit and veg lady, the markets, the hippy food shop which at first was the only place I could find muesli, the cave and this morning I even found my Italian food specialist. I loved to visit the Marché de Noël at Christmas (3). I’ve taken pictures in all seasons. 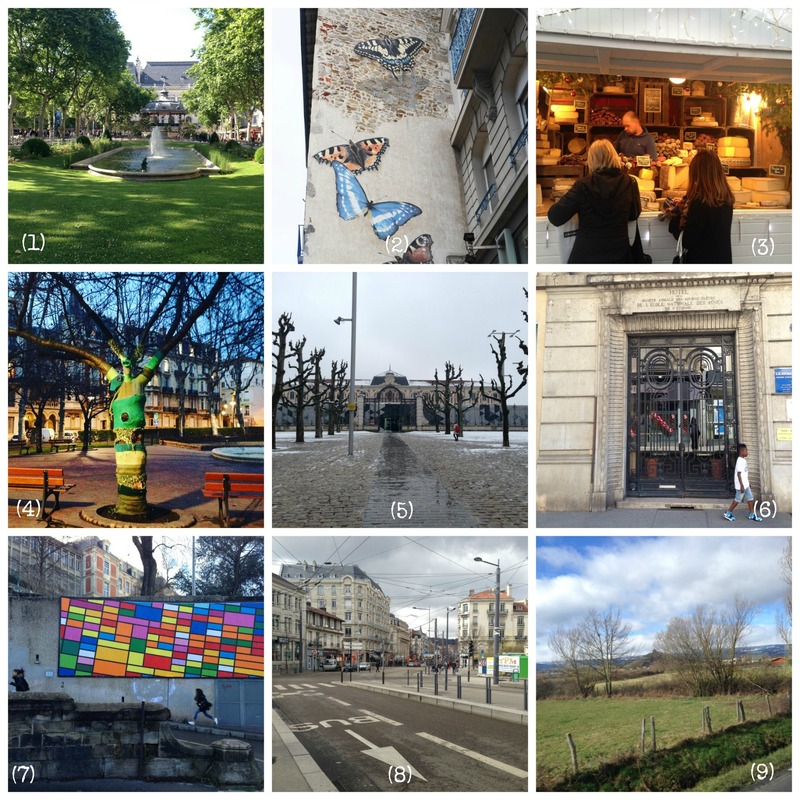 The Hotel de Ville (1), the renovated Cité du design itself (5) – built on the site of an impressively large gun factory, I’ve been yarn bomb spotting (4), and tracked down as much street art as I can (2), including the art project – Le Mur de St Etienne(7). I’ve also done a little bit of exploring in the areas around St Etienne – Chalmazel and Montbrison (9) primarily. Chalmazel has a mediaeval chateau dating from 1230 where you can stay, and a small ski resort; Montbrison has the famous market where I buy my cheese. There is also a Ligue 1 football team who’s predominant colour is green, and who play at the world class Stade Geoffroy-Guichard. With EURO 2016 imminent and one or two games being played here, the City has gone football mad. Sadly I missed out on tickets because I was away when they went on sale. Maybe its just me, but I like a bit of urban mixed in with the picturesque. It shows that there is work going on, and the town is evolving. There are many, here are some suggestions. Bistrot du Boucher – Place Jean Juarez, opp the cinema : As the name suggests it has a menu similar to the ‘Bouchons’ in Lyon – a lot of meat, and country style French cuisine. La Platine – Cite du design : located at the Cite du Design, open for lunch only except Thursday evenings. Rue des martyrs de vingré – a cobbled street in the centre of the city with plenty of bars and cafes. If you have a car then everything is easy. It is a small city and there is plenty of parking. If you arrive at Chateaucreux railway station you can easily catch the T2 or T3 tram outside and get off at the Peuple Liberation stop. That is more or less the centre of most things and you can walk from there – except the first two restaurants mentioned above. Both of those are easily accessible from Jean Juarez and Cite du design stops respectively. 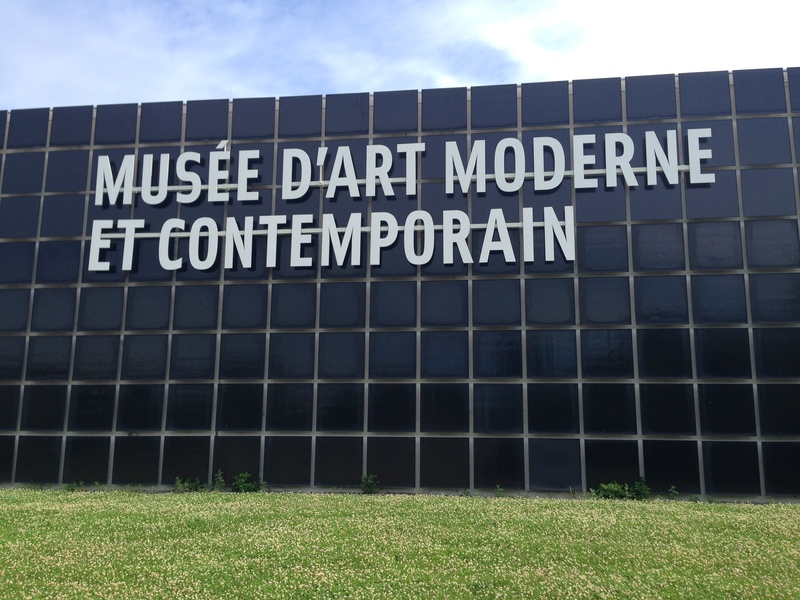 Musée d’Art et d’Industrie – incorporates a permanent exhibition of local industry and temporary displays. A cheese buying morning expedition to nearby Montbrison – link. This blog was updated on 11 July 2016.  If you liked this blog, don’t forget to recommend it to your friends and / or subscribe to the Agatha Bertram’s enewsletter. Enewsletters are sent once every two months with blogging highlights that you may have missed. 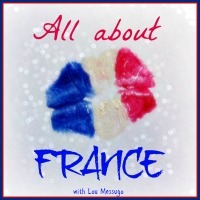 If you’ve come across from the Lou Messugo’s #AllAboutFrance blog linkup you can get back here. As long as there’s some beauty among the post-industrialist buildings then I like places like this too. It’s good to see St Etienne is redefining itself with design, the yearn bombing is so cool. Does it also have edgy street art, like Marseille? I studied in Le Puy En Velay in high school with an exchange. It was wonderful. I love the area. I remember taking the TGV to St. Etienne then boarding the old commuter train over to Le Puy. I highly recommend visiting that area. But I thought St. Etienne was very nice and enjoyed our excursions there. Hi Sarah, wow! You have a close connection. I havn’t been out much to the surrounding towns or areas, but I’d really like to. I’ve read about some great hikes. I like Saint Etienne as well now, but it took a while to get to know the place.